1. Preheat oven to 350F and line two cookie sheets with parchment paper. 2. Combine the oats, nuts, brown sugar, and cinnamon in a large bowl. 3. In a medium bowl, combine the coconut oil, honey, vanilla extract, and banana. Microwave for 30 seconds and whisk until completely combined. 4. Pour the wet ingredients over the dry and stir until combined. 5. Spread the granola evenly on the baking sheets and bake for 15 to 20 minutes. The granola is done when it is golden brown. 5. 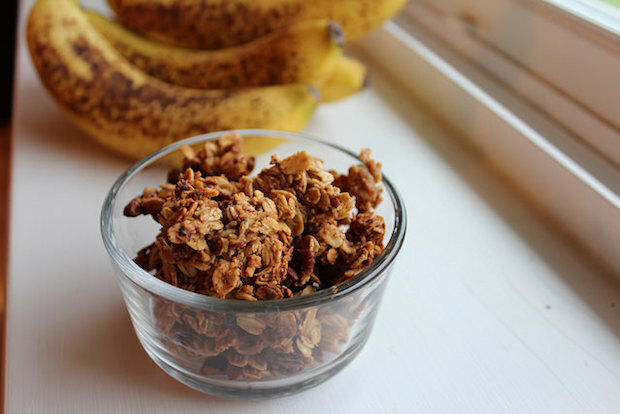 Remove granola from the oven and cool completely. Store in an airtight container and enjoy!